We decided the best time to go outside and do loads of manual labor on the yard would be August. In Texas. Poor planning on our part, obviously. If you are unfamiliar with Texas weather, we have 4 seasons here: Hot, Really Hot, Hot as Hell, and Hot with a Few Freezing Cold Days Until 10am at Which Point it Gets Really Hot Again. August would fall under the Hot as Hell season. 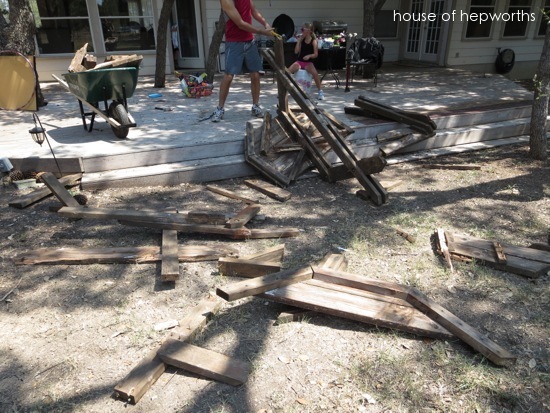 We also like to party during the Hot as Hell season considering school is out for 3 solid months, so doing manual labor on the yard is a necessity if you don’t want your friends to think they’ve shown up at the Clampett’s house. So we got to work. There is still so much more to be done, but we do what we can when we have time without working too much and suffering from heat exhaustion. The first order of business is the pool. Always the pool. 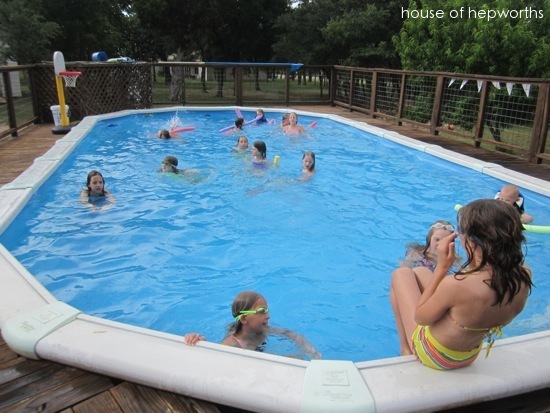 The house came with a big oval above-ground pool. 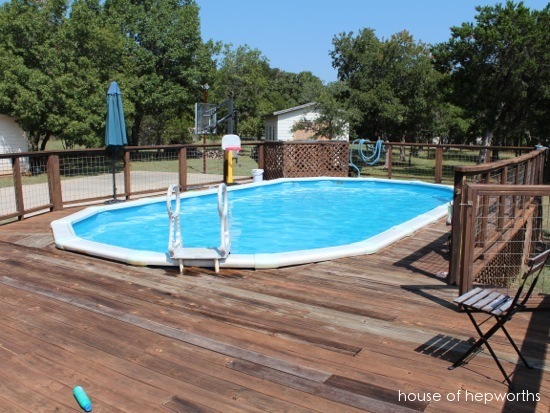 Eventually we’d love to put in an in-ground pool, but the pool we have certainly hits the spot on those really hot days. A $400 trip to the pool store to pick up new filter parts, and a crash course in water testing, chlorine and PH levels, and you’ve got a crystal clear pool again. The pool has made for some of the best parties this summer. 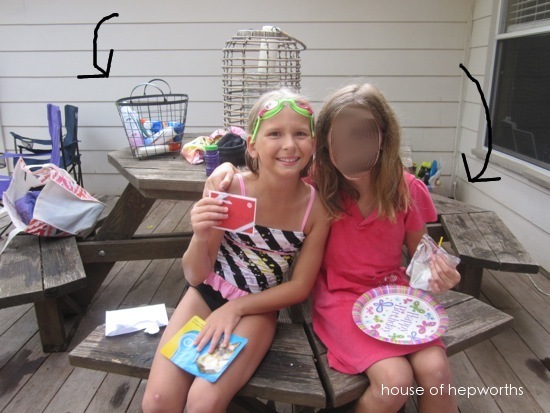 I have a go-to lifeguard that I hire so the kids can swim to their hearts content while the parents ignore all of them and have our own party sitting on the deck, or better yet, inside with the air conditioning. I joke to the kids that the parties are for us and our friends, and they get to just play with whatever kids show up. Good thing we met most of our friends through the kids’ various school and extracurricular activities. Ha! Apparently I was so eager to demo this table that I have no pictures of the actual table, so pardon all the random background shots of it. 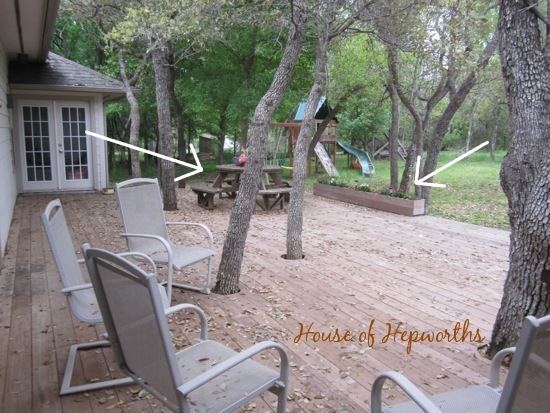 Here’s one from the photos I took of the house before we bought it (the chairs in the foreground are the previous owner’s). 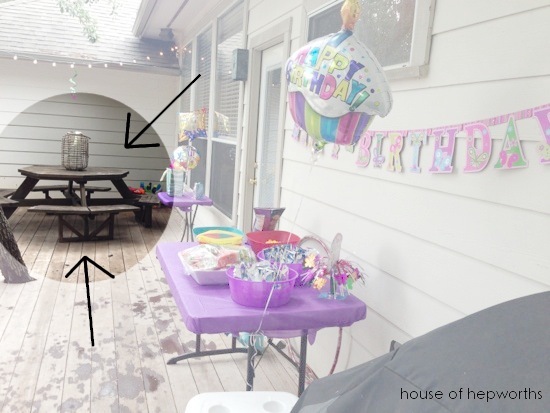 And here’s one more of the offending table during my daughter’s 9th birthday party last June. The table doesn’t look half bad, but trust me, it was an accident waiting to happen. I added several new screws to the table when we moved in, just to tighten it up more, but the wood was too rotten to save it, which is a bummer because we were excited that the previous owners left the table for us when we moved in. So we demolished it. I basically flipped it upside down and then just gave it a little nudge and the thing collapsed. From there Ben went at it with a sledgehammer. 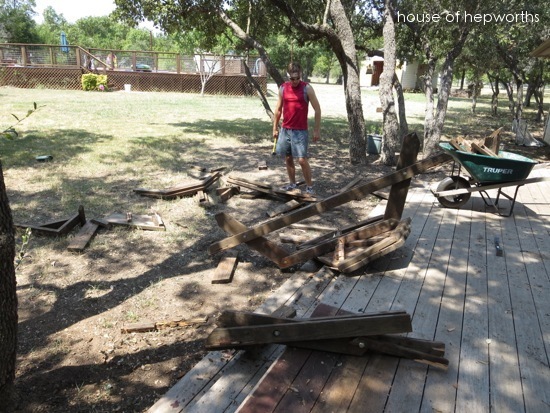 The table was so rotten that we didn’t have to do much to get it into small pieces. Since Ben was enjoying the demo of the table so much, I let him have at it while I cleaned up the pieces and put them in our trash pile. 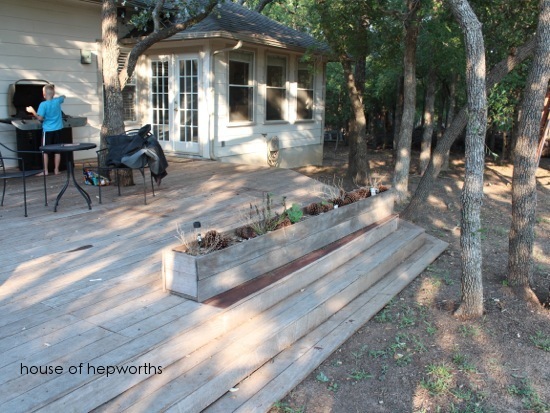 The final big project we’ve done around here is dealing with this flower planter. The plan was to move the planter box to the side of the house under a span of windows we have. First though, I had to unload all the dirt. It took two full wheelbarrows full to empty the planter. 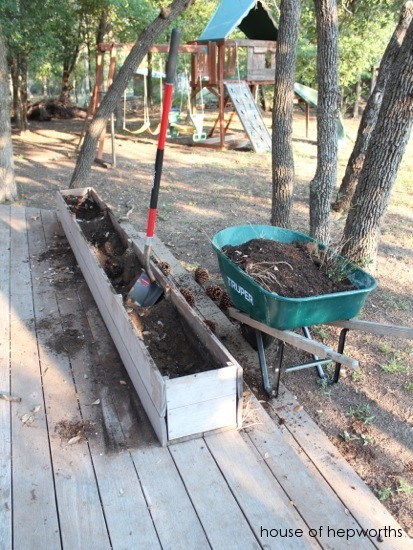 Who would have thought this seemingly smallish planting box could hold so.much.dirt? Finally the planter was empty. 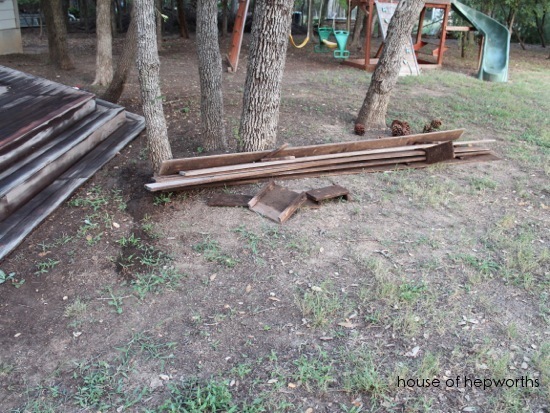 My son and I each grabbed an end and as soon as we picked it up, the entire thing collapsed into a pile of scrap wood. Darn it! It was nice looking and functional, but not well built. 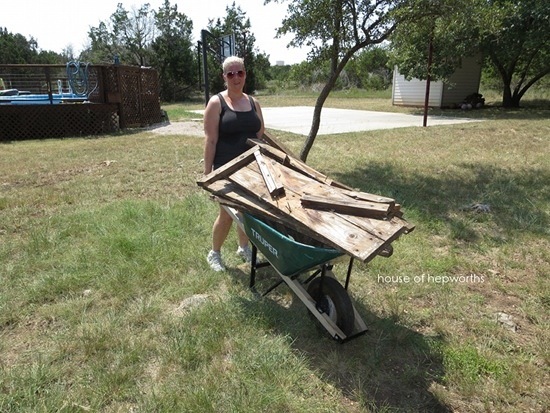 The wood used were decking boards, and those suckers are heavy! I managed to get them in a pile off to the side, and then Ben and I carried them away later that day. Apparently the deck is in urgent need of a new stain job. 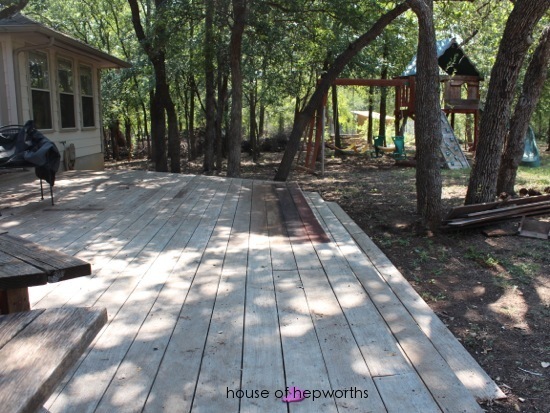 I didn’t realize the deck use to be red, but now that the planter is gone you can see the original deck stain color. 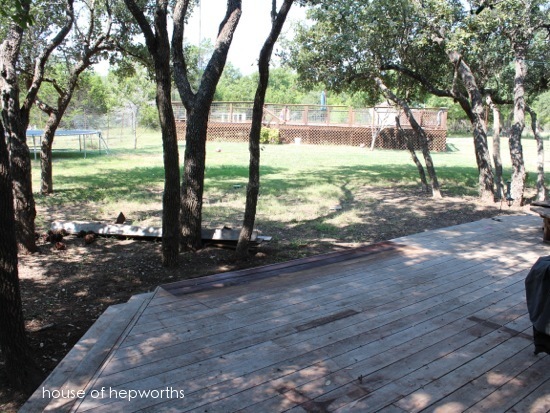 Ahh, A nicer view for sure (except for how tacky it looks with a big barn-red rectangle on the deck). I like how much cleaner the view is now. It felt too closed off before. 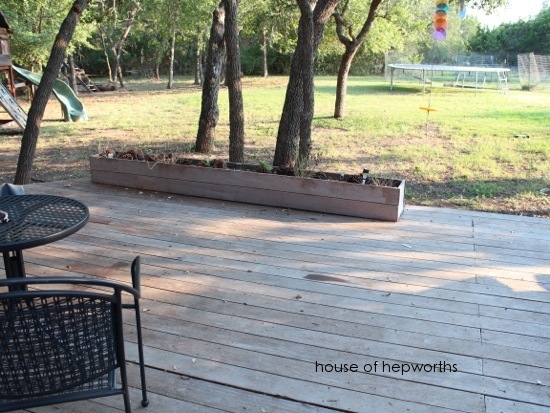 And here’s a few more views of the deck sans the planter box. 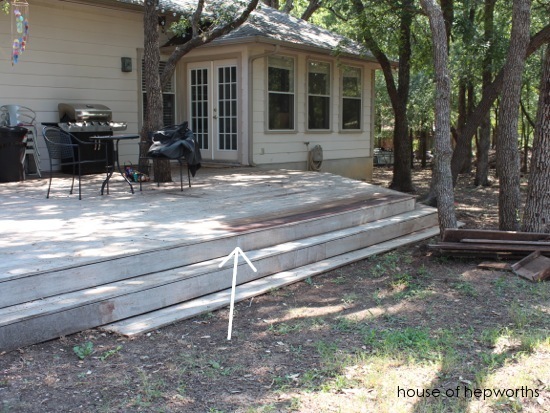 Here you can see that there are stairs that wrap around the side of the deck. They were blocked before. I’m sure it sucked at the time, but your description of firing the pool boy made me do a lot of snorty laughing! You rock! Glad you have been enjoying the pool. It looks big. Neat idea to hire a lifeguard! Y’all are super studs doing all that in August. I just went from one ac-conditioned place to the next … Ya know cuz it’s hotter n hell up here in Dallas, too. Lol. Tabitha’s right…y’all are super studs! TOO hot in Montgomery, Tx in August for that kind of outside work. Also, schooch is a word in Texas! My Memaw taught it to me years ago. Finally, LOLed at the way you handled the pool boy. Hate that you had to go through all of that but lesson learned and it makes a great story. My hat is off to you. I can’t even manage to work outside in August in Western North Carolina. You know… when it gets up to 85 and everyone from the mountains feels like we are going to die and the rest of the country laughs at us? My lawn looked, very much, like an overgrown rainforest for the entire month. Now we have started cleaning up again. 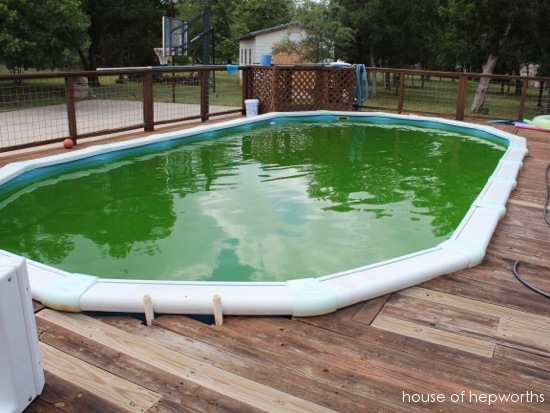 The pool looks awesome, good work on being a do-it-yourself pool boy. We had the same problems when we moved into our house and we also hired a pool company and had to fire them, we finally found prime pool service and have been very satisfied, they have even come twice int he same day to make sure what they fixed actually worked. Definitely will have to try out the lifeguard idea. I know from my own experience that living in a house is very difficult in the way that you have got to do a lot of work around the yard and your garden and especially if you have a swimming pool, because it takes a lot of time to clean it. Your backyard is beautiful. 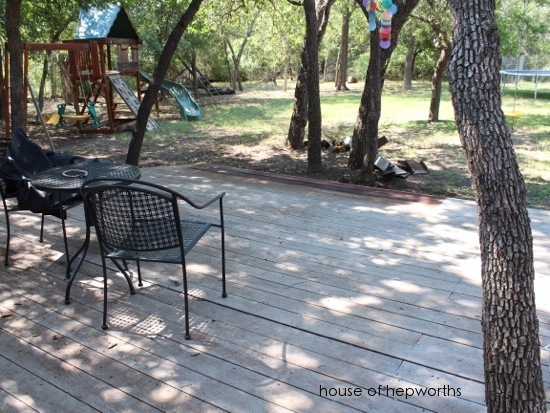 I saw a house, with a deck like that, when we started house hunting before we decided to move to the Valley. 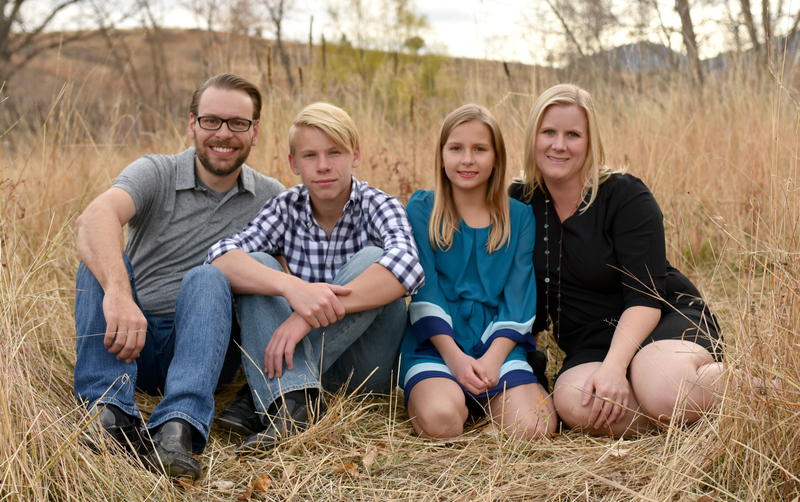 Instead we bought in the Valley and I quit to be a stay at home mom. If I had known how hard it would be to get a job again I never would have quit (it’s a long story). 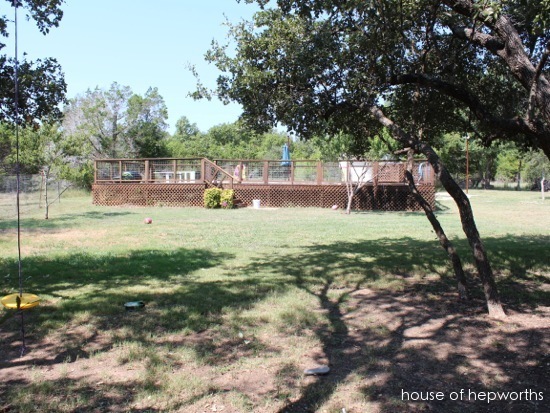 Anyways, your yard is nice and large and what a gorgeous pool. That is my dream, to have a pool. I’d have to remove a few trees to have one though. I recently found out I’m allergic to the trees so if I do get rid of them I’ll be happy to see them go. Hoo boy, I know about heat. I lived in Central Louisiana most of my life. We would go to school at 7:30am in winter coats and come home at 3pm hot as hell. What a difference it makes to knock out a planter box. Probably seemed like a good idea at a time long long ago. I used a Flood product on my deck that was the best ever, I was so sad to discover it right when I moved from that fabulous deck. Hope the new owners enjoy it. What a great job on the pool! Thanks for the ideas.